I heard that butchers in Scotland are called Fleschers - is that right? I've been in Scotland a lot but nor recently so do not remember seeing Flescher instead of Butcher on shops. Googling is not friendly to get the substantiated but FodorXprts certainly can! Pretty close to German "Fleischer", by the way - which means, obviously, flesher / butcher. Thanks Cowboy! Flesher - makes sense vs German flescher. Normally see "butcher", not been everywhere but not seen "Flesher" when I'm up there. In a decade of selling meat to the public practically everywhere in Scotland, I never heard the word used, by butchers or shoppers, to describe anything to do with killing, dressing or selling meat. The word cropped up to describe a bit of Glasgow Green (generally written Fleshers' Haugh.) This is connected with the Incorporation of Fleshers: one of Glasgow's Incorporations, roughly equivalent to the City of London's livery companies - and generally as irrelevant to the modern business of doing whatever the Incorporation nominally is connected with. Some do a bit of sponsoring trade-related apprenticeships or retirement homes - but that's more or less it. Just as London's most venerable company is the Mercers (clothing and fabric traders), but no-one talks about Mercing any more (though the crowds outside Primark make it clear the activity is still popular), the Fleshers belong to a museum of ancient Scottish. The word itself, though, is interesting. One of the most fat-headed of the many myths the Scotch cling to is that their common speech shows how close to France they've been. It comes from the fact that the Lallans for leg of lamb is "gigot". In fact, the whole point of Lallans is that it generally lacks the twee frenchifications real English acquired in medieval times, and remained stoutly Germanic in its word sources. so flesher is archaic - I forget which food guru said that is was not but he obviously had not been to Scotland and perhaps a reason this old mind could not remember seeing Fleshers on buthcer's there. Thanks to all for your edification on this! Any other examples of the Germanic roots in Lowlands Scots? That's much more likely to come from Scandinavia in relation to Scotland, than Germany. "Although classed as a single park, Glasgow Green is a composite of a number of areas which have been added together through the centuries, many of which have retained earlier names. The most significant of these is the Fleshers’ Haugh, an area of land largely contained on three sides within a loop of the River Clyde, at the Green’s eastern extremity. A "haugh" is a Scots term generally applied to low-lying, level meadowland beside a stream or river. In far off days, and reflecting the supremacy of the medieval Church, this particular haugh was known as the Priest's Haugh. .... The alternative name of Fleshers' Haugh, and the one most commonly used today, arose when the members of the Incorporation of Fleshers were allowed to use the pastureland there for their animals. 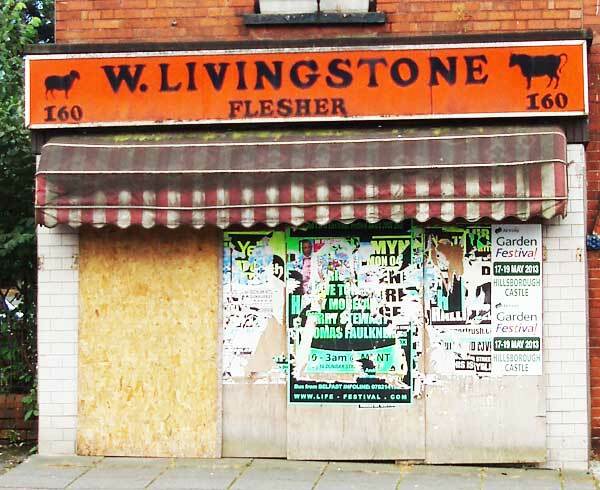 A flesher was the old Scots name for a butcher, but who then undertook a wider range of tasks associated with their trade than present practitioners would." "The Fleshers became an incorporation in 1580 to regulate the affairs of those who provided meat for the growing population of Glasgow. There were "provisions for the inspection of meat, the punishment of malpractices in connection with the selling of same "market dues of unfreemen bringing their beasts to town and provisions against the throwing out of bags, paunches and tripes upon the High Street"plus numerous other rules. Times have changed and control of the meat market was passed over to the City Council many years ago. The trading monopoly of the Fleshers, along with those of all the Scottish Incorporations, was abolished in 1846. The Craft has preserved its strong links with the meat industry and continues its charitable work for those connected with it. It has a substantial fund for the benefit of needy pensioners and a successful fund raising '400 Club' founded to celebrate the Craft's 400th anniversary in 1980. There is an active service group who organise theatre outings for pensioners. Like most of the Glasgow Crafts, it elects 4 members annually to the Trades House." I was talking about 'kirk' cited in the post above mine. The Norweigan is kirke. Thus the example of kirk as a Germanic influence on Scotland is quite possibly erroneous. When you google West Germanic Languages you will find a multitude of words with the same origin. Norwegian kirke, Dutch kerk, German Kirche is just one example. Often some regions made a shift in pronunciation as in ch > k which can blur the origin a bit.